It's the summer holiday period here in the UK and schools are out for the long break. 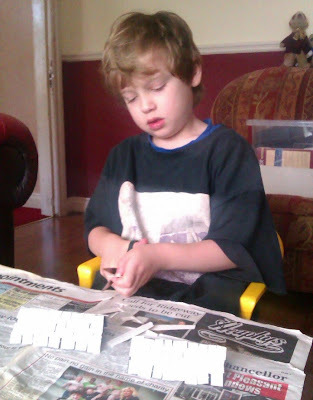 My son Noah decided he'd like to help me build something for Warhammer and with a Siege game coming up there is lots to do, so I readily accepted his help. 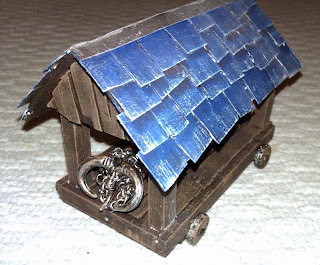 I've already posted on building and converting a Mighty Fortress, building siege towers and painting the castle so I figured that Noah could help me with the building of some battering rams. I wanted to get him to do as much of the work for this as possible himself. His last school report was glowing apart from the sections pertaining to Art and Design & Technology. I wanted him to gain some confidence with measuring, cutting, glueing and painting with different materials. I think he's done a great job! We started off by making the roof sections for the rams. 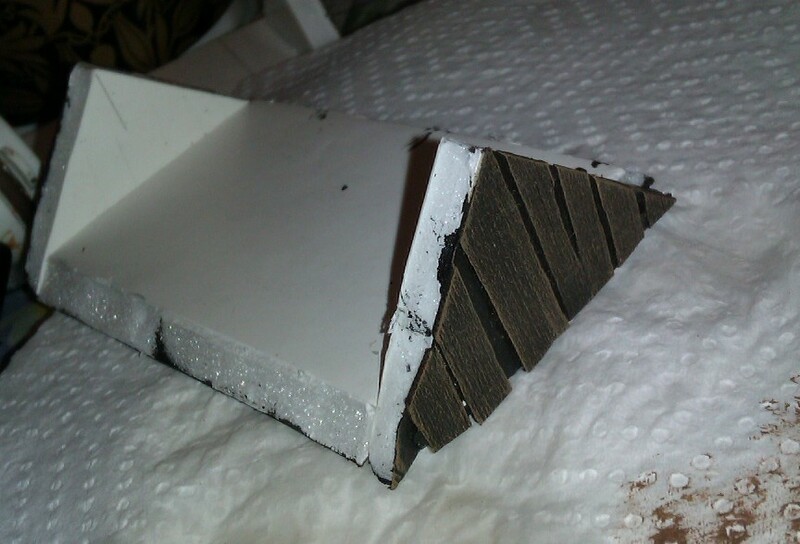 A base section of foamcore was cut with two triangular foamcore end-pieces added that we could add a pitched roof to. 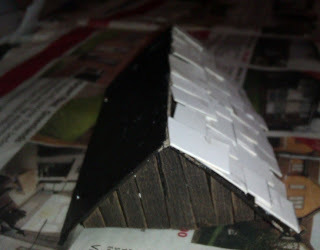 The end-pieces were clad in roughly-cut balsa and the whole thing painted black. 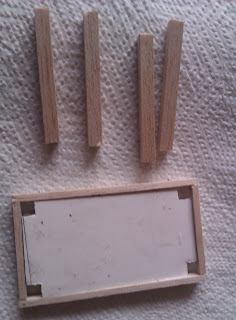 When dry, the balsa was drybrushed with two shades of brown to bring all the wood-grain back out. We cut some thick card rectangles and scored them once along the middle so that they would fold neatly. This would be the support for our roof tiles. These also were painted black then glued into place. Next we cut out some small squares of card from a cereal box and glued them in higgledy-piggledy fashion to the black-painted card to form tiles. 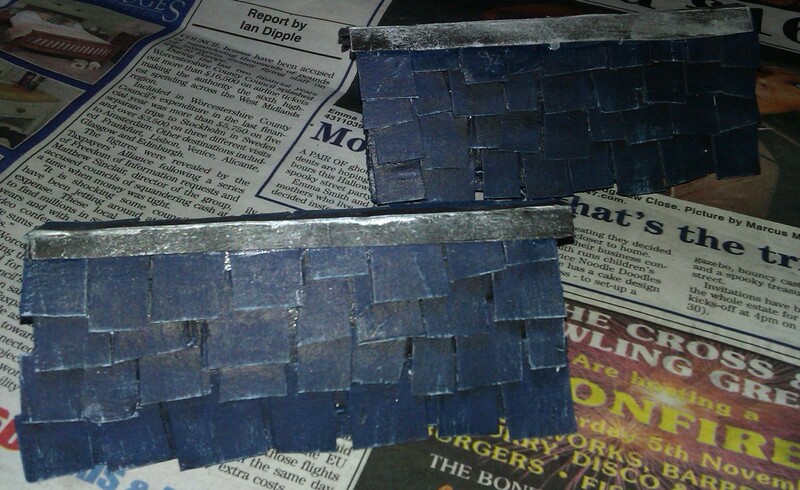 We also painted these black, before overbrushing top-to-bottom with navy blue and then drybrushing bottom-top with white. We then cut some more foamcore to form the base of the model (I trimmed the small square insets at the corners that would accept the "pillars") and also cut some balsa struts with which we'd clad the sides of the foamcore and that would form the pillars. Balsa "planks" were glued on the upper surface. 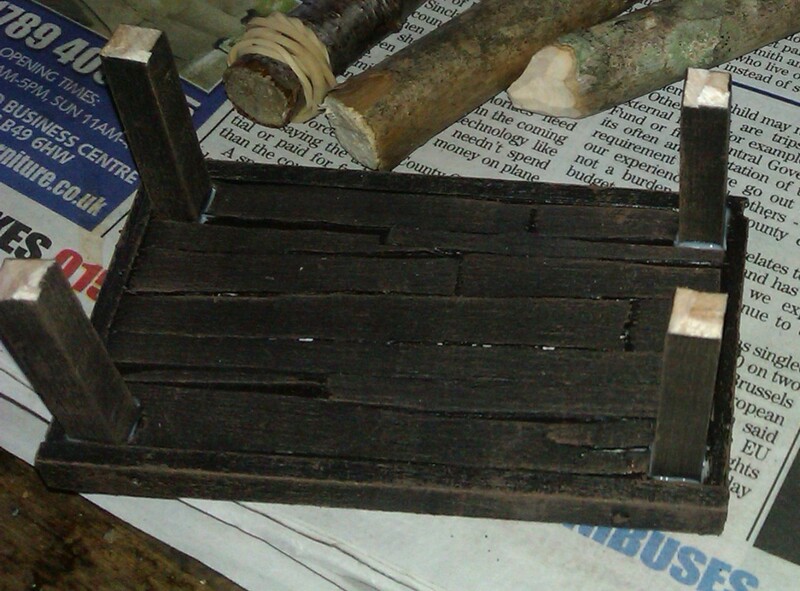 The whole thing was painted black and then drybrushed with two shades of brown. 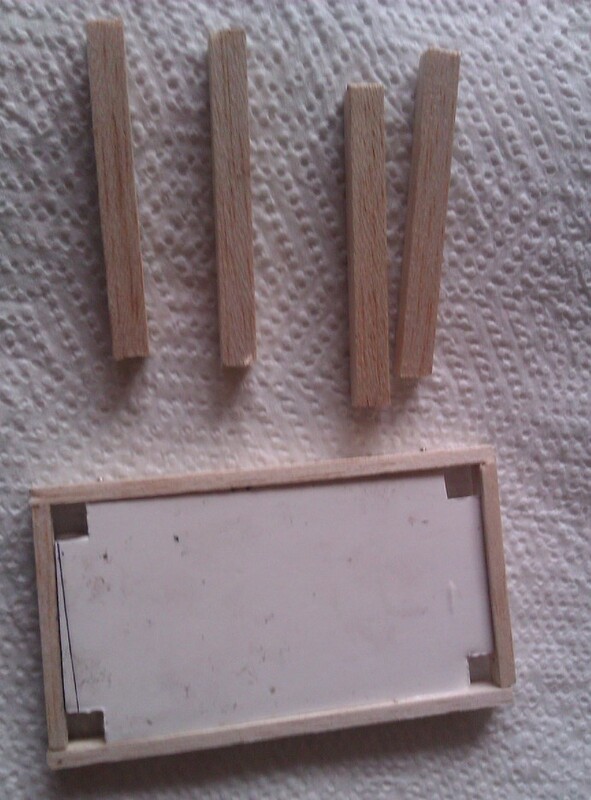 Then the supporting pillars were glued into the corners. The long-overdue final update to this project. Once we'd reached this point, this project fell by the wayside a little. School started again and "real life" got in the way a bit too. However our hand has been forced recently as an (imminent) date has been set for the Siege (tomorrow!) so we needed to finish up. Next we started work on the rams themselves. We'd picked up some reasonably sized sticks when walking in the woods recently which we cut to size with a razor saw - we one end cut "square" and the other to a 45 degree angle (to later accept a "head" - read on for details). We painted them black, gave them a serious drybrushing in a red-brown colour and then painted in the bark-free areas with Citadel "Bronzed Flesh". 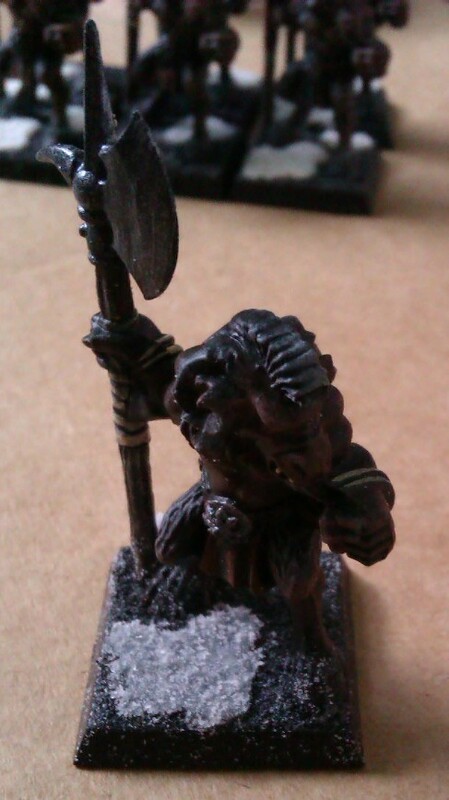 The paint job was finished off using a sepia wash.
Next we drilled then pinned-and-glued some old Chaos Boars Heads (left over from my Beastmen Chariots to form the front of the rams). These were drybrushed up to look metallic and glued onto the rams. Next, we cut some chain (from an inexpensive costume-jewellery piece) to length and wrapped it round the rams (sticks), securing it in place with some PVA. The chains were pinned into the foamcore base of the roof section with tailor's pins. Then we attached the roof to the base (some small holes were made in the base of the roof to accept the corner-pillars) with more PVA. One fault here on my part was not making sure in the early stages of the build that the pins I'd used to secure the triangular end-pieces were either removed or put in a more sympathetic location - these were buried just below the surface of the location where I wanted the corner pillars to slot into the base of the roof and as such the roof isn't as securely fixed as I'd have liked. It was impossible to remove the pins at this stage as they were now hidden beneath the balsa "planks" that were cladding the end-sections. Ho-hum. I'd completely forgotten to take into account the fact that the boar-heads had mass! When installed, the logs see-sawed nose downwards. We had to remove the rams from the model and add replace the metal heads with some plastic bits (a Beastman Standard top and a Chaos Spawn head). 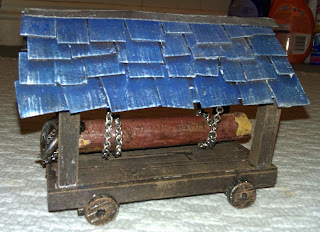 They were a bit too small so we covered the join by wrapping a bit of chain around the point where they met the "logs". Paint black, drybrush metal. Problem solved. Lastly came the wheels. 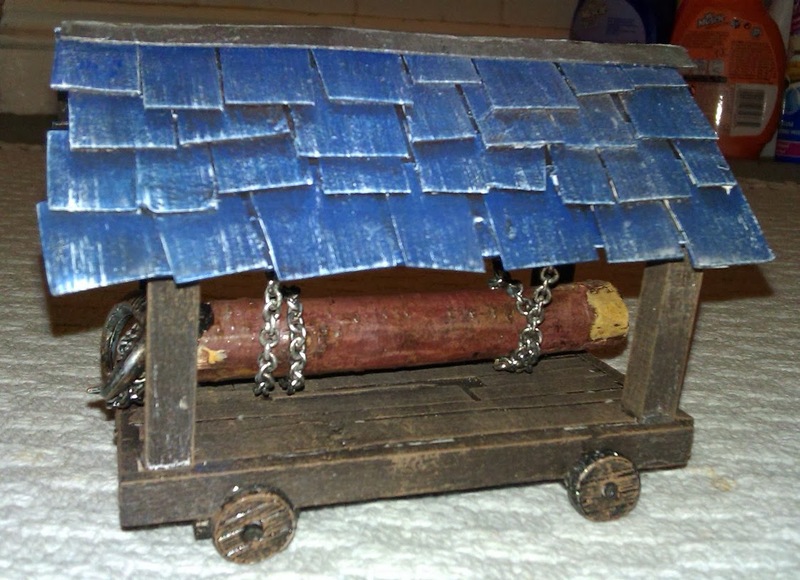 Some plastic rods formed axles and the wheels were painted and attached using 2-part epoxy glue. Pushing in some of the reinforcing tailor's pins. Penetrating the cardstock requires quite a "push" so I did that. Noah then pushed them home using a rubber-tipped pencil. Cutting the log-rams to size and shaping the ends to accept the boars' heads. Flattening and drilling the boar's heads - they're lead pieces so difficult to work safely on with small hands. 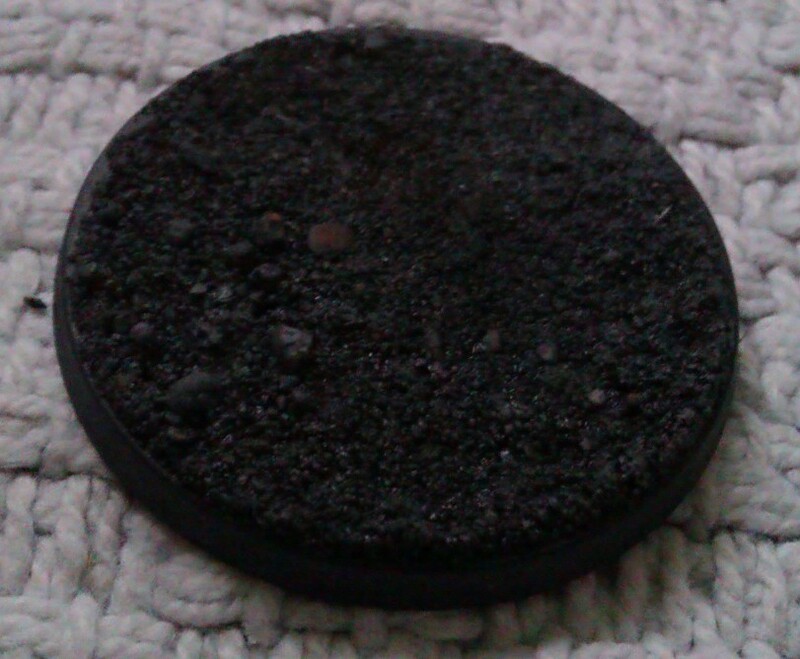 Basing is dull. I've always thought so. Especially *my* bases. When I first started work on my first army (Dwarfs - not yet represented on this blog but long overdue to be revisited) I got to the end of the job painting of painting minis up and then the bases just got a coat of Goblin Green and that was it. Things got a little better when I did my Imperial Guard - I took the time there to add some sand before painting with GG and drybrushing a bit, then adding a bit of sandstone colour to the bigger rocks on the bases. I was pleased with it at the time but now I look back at them I find those bases horribly garish. 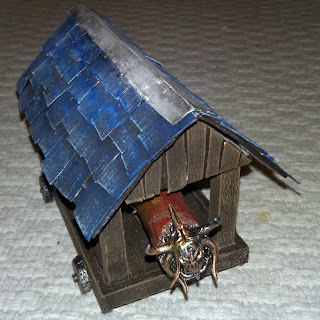 When I got started on my Warriors of Chaos, I decided to deliberately mute the palette and went for a darker, more broody feel. The GG was replaced with black with a grey drybrush. 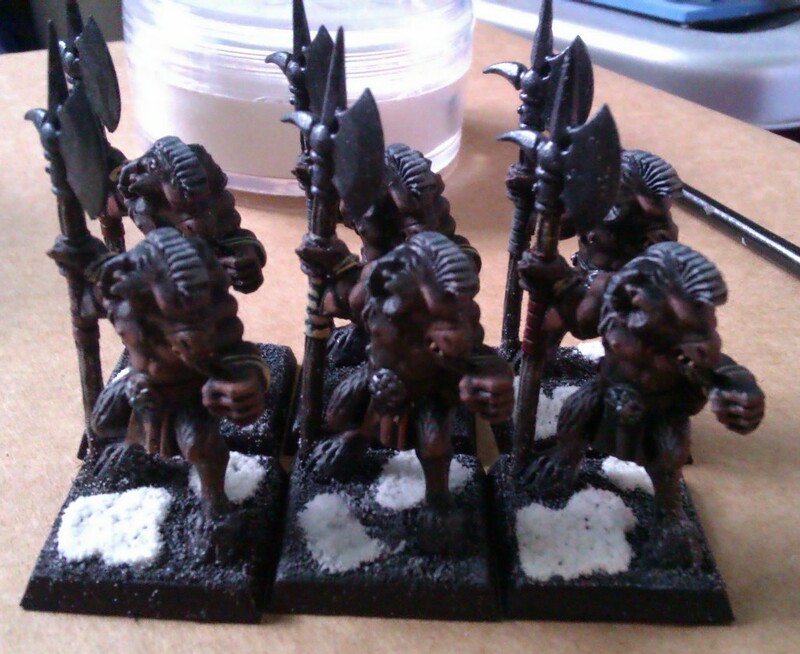 A few bones on a random selection of bases finished them off. Next up came the Beasts of Chaos. There were shared components with the WoC army (Giant, Ogres, Warhounds) so I needed the same basing scheme, but at least this time I thought to glue the sand in place before spraying the black base colour on. Trouble was, I'd run out of bones so the bases took a step back towards being more dull again. I recently decided to re-approach basing, so I got some modelling snow and added it to the bases of my Beasts as described in this post. 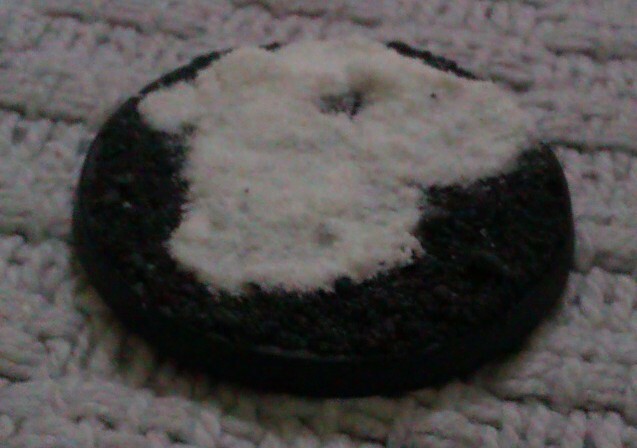 Pleased as I was with the snow, the stark black/white of the base/snow was too extreme so I decided to go the whole hog and revamp my basing completely. Having no experience with basing properly at all, I decided to have a go on a test base and pop a quick post up for opinions and advice. Which is what you're reading now. As the idea was to build on bases that are already attached to painted models, I started my test base off the same way my current bases are built. I was nervous about adding the grass - I'd never used it before and envisaged having clumps of grass lying horizontally on the base or sticking out in weird directions. Somehow, it didn't work that way. A generous blob of PVA and a dip in my tub of grass and it just worked. 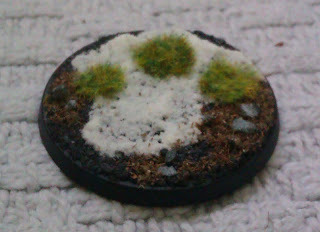 Up until the static grass went on, I really wasn't sold on the base at all. With the grass in place though, I think it looks pretty good. I like the "spring peeping through the melting snow" look and am almost looking forward to the tedious drudgery of fitting out all of my models in this way. As a final update to this post (Now autumn 2014) I've added a section right at the end - possibly the most important section of all. I originally wrote this post in the summer of 2013 when I was working hard to get into airbrushing for the first time. Since then (it's now Autumn 2013) I've found and overcome more problems so I thought I'd share them alongside my original findings. All the newer updates are in cyan text, all the original stuff is in white. I'll start by saying that I'm no expert on this subject. Not by a long chalk. I've owned an airbrush for a couple of years now, but the amount of time I've actually logged using it doesn't amount to more than a few hours, and at least 75% of that time I would classify as "getting frustrated" time. What you need your airbrush to do is the one and only job it was built for - shoot paint evenly. Actually getting the airbrush to do this has been my biggest frustration as an airbrush owner. I've spent far more time failing, getting stressed and wound-up by the airbrush than I have actually achieving results with it so far. Mix your paint thoroughly. I bought a milk-frother to help out - it's brilliant and very inexpensive (less than £2.00) and will blend your paint with your thinning medium with very little effort, An image is below for reference. Mix your paint with the correct "medium". What is "correct" for you amounts to "whatever you can use safely and happily". There's a lot on the web about using "Windex" (an ammonia-based cleaning product, not available in the UK due to marketing restrictions on ammonia) and Iso-Propyl Alcohol (IPA) to thin acrylic paint on the web. I'm not going to say that that advice isn't valid, but tapwater seems to work just as well. I saw a video of a seminar by the VP of Badger airbrushes on the Miniwargaming.com website a while back - he advocated just using water too. Update: Since originally writing this article I've changed my stance on this somewhat. I'm now using a 50/50 blend of tapwater and IPA. The reason being is that I found just using water that the paint was taking a long time to dry on the model. As the IPA is an alcohol, it evaporates much faster so you can handle your model a bit more easily. Take care to remove any particles from the paint. They *will* gum up your brush. I bought a tea-strainer to help me with this. After you've mixed your paint with your chosen medium, run it through the strainer. I've never yet done this without catching some particles. An image is below for reference. Aim for that "milk-like" consistency that everyone talks about. This seems to cause much confusion, but what I try to do is to get my paint to behave the way milk does by visualising the way milk runs down the inside of a glass or bottle if you tip it at an angle then level it out again - it leaves a thin film that thins further as it runs down into the glass. Try to get your paint to do that. I tend to use a gravity-fed brush and this item of advice pertains particularly to that brush type: don't overfill the cup. I'll explain why in the "How to clean" and "When to clean" sections, below. I never fill mine more than about 40% full. If in doubt, clean it! Even with all these precautions the airbrush still needs periodic cleaning, often in mid-job. The tea-strainer (upper) and milk-frother (lower). I'm sure you'd worked it out anyway. Regularly remove the nozzle-cap and give the protruding needle-tip a wipe with a soft tissue. As a test, if you retract but don't depress the trigger ("main lever" in the schematic below) you should see the needle pull back out of sight. If you wipe the airbrush tip on your tissue it should leave a thin line of paint. If not, you have a blockage. With the nozzle-cap removed, look into the front of the nozzle-cap. Paint builds up here and may cause the aperture that the needle protrudes through to become blocked. Clean it out with a q-tip or similar. "Bubble" your brush. Take care with this if you have a lot of paint in the cup as it will overflow. Cover the nozzle-cap with your finger and depress and pull-back on the trigger. This will cause a backflow of air from the tip of the brush along the needle and back into the cup. If there are any particulates blocking the flow of paint they should be blown back into the cup. This is one of the reasons I advocate not overfilling your cup. Rinse it out - tip any paint you still have in the cup back into your paint bottle, turn off your compressor and disconnect the air-hose. Walk to your sink and slowly run cold water into the cup to wash out all the remains of the paint. This is particularly effective when you've emptied the cup by "painting it dry" and then "bubbled" the brush straight afterwards. Leave a small amount of water in the cup and when you've reconnected everything, shoot the water through the brush onto a tissue or neutral surface. You should be able to see a neat cloud of paint with no sputtering or spitting. Take it to bits and wipe it all down. You probably don't need to do more than remove the handle and nozzle-cap, release the needle chocking nut and then pull the needle out. Wipe the nozzle cap, nozzle and needle clean with soft, damp tissue. You can normally do this with water, but a small amount of white spirit can be useful too. If you *do* use white spirit, make sure you blow it all out of your brush before pointing it at your models or all the hard work you've done might be damaged. Take an opportunity to rinse it out at the same time. 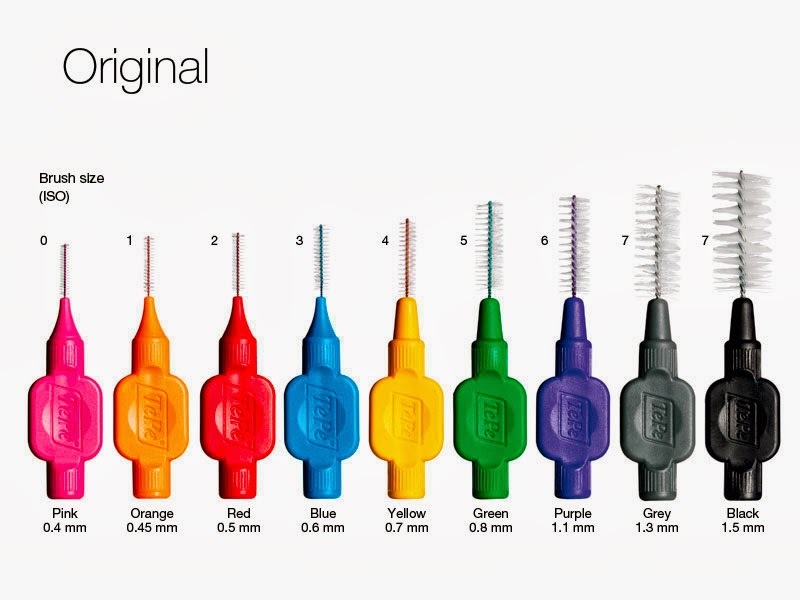 Get some interdental brushes from wherever you shop for your toothpaste - these are great for reaching into the siphon tube (on a siphon brush), down into the channel that runs from the paint cup to the nozzle (on gravity-fed brush) and various other places to boot. MAKE SURE THAT BEFORE YOU START THAT ANY PAINT THAT MIGHT BE IN THERE HAS SOMEWHERE TO GO! For example, if you're going down the cup towards the nozzle, take the nozzle off first otherwise you'll just force thick, dried paint into the nozzle and bung it up for good. Use these in conjunction with an appropriate solvent (white spirit if you've been shooting oil-based paint or IPA if you've been using water-based paints. White spirit can be useful here too, though). I use the red one on my airbrush. Whenever you've finished for any period of time of more than a few minutes. If paint dries in the brush, especially in the nozzle, you're in trouble. Whenever the cup is empty, give it a clean. This is one of the reasons I advocate not overfilling the cup - less paint means more frequent cleaning. The extent of the clean at this stage can be judged by how well the brush has been performing for you. Whenever the delivery of paint seems to reduce. This can just mean your cup is emptying, but it can mean a clean is required too. Whenever the paint starts to "sputter" or "spit". If it ever looks like the paint is coming out as more "water" than "paint". I'm not sure of the science behind this, but there are times when shooting paint when what appears to be coming out is just dirty water - it's like the pigment's been left behind. Also see "It's spitting water!" below. Whenever you think you need to, or the brush just isn't behaving as you'd like! It looks like a long and complex process to clean an airbrush, but you'll soon get the whole thing down to about 5 mins tops. Also, you'll learn what your brush needs so you won't have to follow the whole process every time. If you can find a schematic for your particular airbrush, then please refer to it rather than to the one here. This one isn't the diagram for my brush, but for the most part it's a good match (my brush doesn't have a "Crown Needle Cap" for example) and so it's probably a reasonable match for your brush too, but if you can get the exact diagram, all the better. I was working merrily on my Mighty Fortress project a few weeks ago and was finding that the brush was misbehaving. Paint just wouldn't shoot. I'd followed all my own advice from above but was making little headway, so I decided to go for a big clean. This consisted of all the above plus taking the nozzle off and using an interdental brush to clean the channel from the cup to the nozzle and also having a rummage around to see if I could de-gunk the nozzle itself. What happened was I twisted my nozzle-spanner at an odd angle and broke the nozzle (the conical "front" snapped off the threaded "back"). The thread stayed stuck inside the brush. I was on the right track though - I could see that there was a buildup of paint inside the nozzle. I ordered some replacements and (for good measure) a new needle too. I got the thread out of the brush by taking the handle off, removing the chucking nut and then using a pin-vice to grip the back-end of the needle. Pushing forward and rotating the needle clockwise (as viewed from the back of the brush) unscrewed the nozzle-thread and it came out nicely. I completed my clean with the interdental brushes and waited for the spares to arrive. The needle was protruding out of the front of the brush. A very painful discovery when I tried to "bubble" it for the first time. I fiddled and mithered for a while until I resolved to replace the needle. Hey presto - no protruding needle and the brush was shooting well again. I think what had happened was that the constant flow of paint over the needle had worn it down so it could slide further into the brush than it should. The paint build-up in the old nozzle had mitigated against that slightly, but with the new nozzle in place the old needle just wouldn't function. One other issue I've had from time to time is that the brush can spit water (not paint!) when you're painting with it. You can be laying out a nice, even layer and all of a sudden "GOB!" and your clean, smooth finish is toast (with spit on). What this often seems to be is a build-up of water in the host that runs from the compressor. Switch the compressor off, unscrew the air hose from the compressor and lift your airbrush high into the air so the hose falls straight to the ground. You may find water comes out - let it drain completely before you carry on. As a preventative measure, if using a compressor you will probably find that there's a see-through vessel near where your air-hose attaches. That's a moisture trap. It will have a valve (normally at the bottom) which you can push to allow it to drain. I'd advise pushing that valve open with a tissue after every few minutes work. I got a new airbrush (A "Neo" by Iwata) to replace my entry-level Chinese brush. I cannot underplay the difference it has made to the ease of use I'm now getting from the tool. I point it and pull back the trigger and paint flows! All of the above issues still occur and all the advice is still valid, but the number of times I have to follow my own advice has been massively reduced. Almost all the frustration has gone - I'm finally really enjoying using my airbrush! I recently bought some modelling snow from a UK based modelling supplier in order to add some "snow" to the bases of my models (I've always thought my basing to be "adequate but boring" so decided to add snow and static grass). Upon receipt of the "snow" I fairly quickly came to the conclusion that what the substance actually was was good, old-fashioned "bicarbonate of soda". I'm no chemist and have done no testing but in appearance and texture I can discern no difference between the two products. There's no huge difference in cost between the two though: the quantity of "snow" I got was similar in amount to the bicarbonate of soda tubs available in my local supermarket. It cost £2.70 for the snow as opposed to £0.99 for the baking product, but given that the quantity supplied was enough to base several hundred models I'm not feeling particularly ripped off. As you can see from the picture, the snow has a grey transparent look to it. Like dirty ice rather than snow. I experimented with painting the area I wanted snow on in white, allowing the paint to dry and then applying the PVA and dipping into the snow. That worked but was a bit labour intensive. I'm a lazy sod so I didn't like that either. Then I came up with a solution: I realised that PVA and acrylic paint are both water-based so I got an empty paint-dropper-bottle and made a 60:40 mix of PVA and white paint in it. One application of the glue/paint mix and a dip in the snow powder and all is looking fine. I will experiment with the ratio of the mix: I'd like more glue in it than I currently have as the paint is making it a bit runny. One of the things that seems to make the snow look best is if you can build it proud of the surface of the base in little "drifts" so it looks like it's settled thickly on the base. Update: Since publishing this post I've picked up what sounds like a very interesting tip. 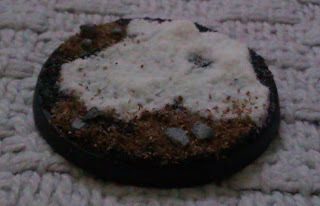 Instead of spreading your paint/PVA mix on the base and dipping it in the snow, mix the snow powder into the glue/paint until it forms a thick paste. Then apply to the base - you can get much thicker "drfits" and add a lot more texture. I've not had a chance to try this out myself yet but am very much looking forward to having a go. I'd also go a little further than I said earlier about having more glue in the glue/paint mix - I think for this you'd need at least an 80:20 mix of PVA:paint.